That’s why we celebrated the Boston Marathon Monday by updating some buyer profiles from our 1,000 Click Club, a highly-motivated group of buyer clients who have viewed at least 1,000 pages on the MLS. If you’re a seller who falls into either category above, we’d be glad to introduce you to our buyers. We assure you that our menu of fees are quite modest by comparison to traditional real estate commissions, and the potential savings are substantial. For example, one of the buyer / sellers matches we helped earlier this year will save approximately $80,000. We can’t guarantee those kinds of savings, but if you’re a seller who’s struggling to get your home ready for the Spring market, we can offer you three hours of decluttering / organization / home staging for just $99 for three hours (limited offer). We’d also like to invite a limited number of sellers to attend one of our upcoming "for sale by owner" seminars, most likely in Arlington, MA or to schedule an in-home presentation. (One of our dreams is to teach 50 to 100 sellers how to save $1 million as a group. We passed that milestone for buyers during one recent 12 month period, see map of client savings). We bought our house in 1987, the year when values actually doubled in 12 months. Prices peaked in 1988, dipped in 1992, and began to rise again in the mid 1990’s. Some people who bought homes at the high prices of the late 1980’s and now want to sell are lucky if they sell their home for more than they paid. The cost of a real estate commission may make the difference between breaking even and losing money. Looking for feedback on our new banner ad directing Boston.com readers to a map of client savings totaling over $1 million during a recent 12 month period, plus a Wall Street Journal article featuring The Real Estate Cafe’s 100% commission rebate option. 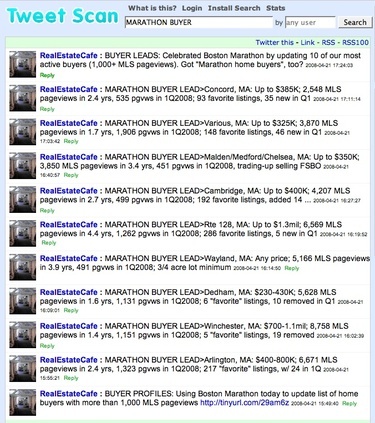 We’ll post a link to Boston.com’s newly redesigned real estate section after it goes live. Fifteen years ago today, Ralph Nader delivered a keynote address at a two-day conference in Boston called, "The Consumer Revolution in Real Estate." Last year, I spoke with Ralph at a book signing at the Harvard Coop about releasing the content of his 1993 speech online. He seemed interested at the time and invited me to follow-up. To celebrate the 15th anniversary, I’d like to get written authorization to release both the text on the wiki below (which is password protected) and the video online? With recent headlines about congressional efforts to rescue homeowners from foreclosure (see BusinessWeek article: The Plans to Save Underwater Loans" http://tinyurl.com/2v9kgh) and Ralph’s recent appearance on NBC to talk about fraud in the housing industry, I wanted to be careful not to release the text of the 15 year old speech or video clips without your knowledge and permission. 3. Publish selected short video clips to blog, and / or wiki. 4. Show the full video at a real estate round table with home buyers, sellers, and real estate professionals. If your team would also like to reuse the content for your own purposes, I would be glad to grant permissions and potentially explore collaborations. As presidential candidates, congress, and others debate foreclosure intervention strategies, and propose reforms to prevent another trillion dollar collapse of the housing market in the future, perhaps Mr. Nader can call for a vigorous investigation of conflicts of interest in the residential brokerage industry and their costs to individuals and society. "My so-called buyer’s agent (who promptly switched roles at contract signing without explanation), initially advised me to bid $750,000 for my house of choice, which was listed at $699,900. When I told her that such an offer was beyond my price range, she was quite adamant that I not offer anything under the list price. When I finally backed out the deal because of her bait and switch scam, I later heard that the house in question sold shortly afterwards for $682,000–in other words, nearly $70,000 less than the bid suggested by my so-called buyer agent." "The next major revolution in real estate will be fee based services replacing the blanket commission pricing that has dominated the industry for so long." Please do not edit the information below this line. It is used to help us diagnose Web site problems. Time to begin a discussion about systemmic flaws and conflicts of interest in the current real estate transaction, and cost of blind bidding wars, not just to individual buyers but to society. Is designated agency an April Fool’s Day joke? What do real estate agents think about "bad brokers?" nearly $70,000 less than the bid suggested by my so-called buyer agent." traffic congrestion, suburban sprawl, etc."